looks like a decent history of loads of big brands with EPS downloads too! Seriously, this is what the UN, the ISO, and the IAEA came up with. Should we take it to mean you can run but can't hide from deadly, deadly radiation? (Better start using that Geiger watch again.) Look for this emblem on a cellphone, CRT monitor, or gauss gun near you. 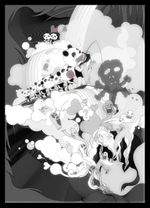 ALA has a nice little article about whitespace. Most of it is pretty straight forward stuff but I was struck by the image (on the right) that was used to illustrate the way space can be used to to give a brand a "cheap" or "luxury" feel. So take a look at the picture; which of those examples screams "Orange" at you? Now take a look again; which most closely resembles the Orange web and wap portals? Po-bo flew back from Cornwall this week with news of a holiday romance. I can see why he might fancy the Cornwall Film Festival bird. Agency A-side, enviably located in surfers' paradise, have used the cornish symbol in the ident for the festival. 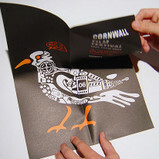 It is a very striking design - using monotone illustrations associated with film/cornwall, wrapped into the shape of the Chough. The branding is then applied to a set of printed stuff, such a shame the brief didn't extend to the somewhat contrasting website. FOR SALE: The wanted poster used after the assassination of Abraham Lincoln in 1865. Interesting because of what it tells us about the state of wanted poster design in those days. Not that good if you ask me. Not only is it not immediately clear from the poster who has been murdered, the but top half can only be read as "reward the murderer" which I assume isn't their intention at all. Also I can't help reading that "reward! reward! reward!" as like "hurry! hurry! hurry!" as if people should rush out to find the murderer while stocks last. It'd be interesting to compare this with the wanted poster that was used after JFK's assassination as I'm sure the police had become much more media-savvy by that time.